Like many blokes, we can't help ourselves being drawn to complicated looking watches, stuffed full of rotating bezels, dials and obscure markings, and if the thing comes in a chunky metal case and lights up like a Christmas tree at night, all the better. Naturally, it has to be waterproof to something like twenty thousand leagues under the sea (even if it's unlikely to go much deeper than the washing up bowl) and come liberally furnished with buttons, functions and a beefy strap. Oh, and if it looks like the kind of thing a commando would wear on a heroic mission, we'll be even more interested. 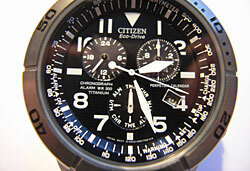 But there's not much point having all that manly technology pulsating away on your wrist if the battery conks out when you're scaling the Eiger, and here's where the Citizen Eco-Drive watches caught our eye. The power is then stored by a "revolutionary" lithium-ion rechargeable battery which Citizen claims can store enough energy to power the watch for anything up to four years, depending on the model. It's intelligent too - so if the watch is kept in the dark for a long period, it switches to a sleep mode to conserve energy, with the second hand parking itself at the 12 o'clock position. 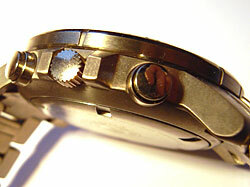 As soon as the watch is exposed to light again, the second hand whizzes across the dial to the correct time. 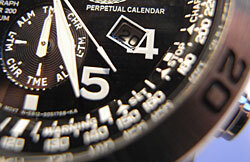 Although the light-powered technology no doubt adds a few bob to the cost of the watch, it's worth bearing in mind that when you replace the batteries on a conventional sports watch you'll probably have to send it off to have the case resealed properly - an unwelcome extra (recurring) cost and inconvenience. 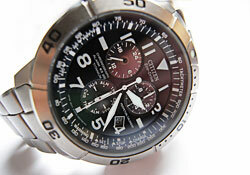 With the Eco-Drive you can kiss goodbye to buying batteries forever. We decided on the above model, which comes clad in light-but-tough titanium case (�50 percent lighter than steel, but 30 percent stronger,� fact fans!) and offers an alarm, 1/20-second chronograph and perpetual calendar, automatically adjusting for leap years through to 2100. Gadget fans will no doubt warm to the pleasingly complex display of three sub-dials, including a 24-hour display and a mode dial for selecting local time, calendar and alarm functions. Dominating the display is a pair of large, luminous hands that glow a pleasing high-tech blue at night, along with a white second hand, plus a date display window at 4 o'clock. The watch is protected by a scratch-resistant, non-reflective mineral glass crystal with water resistance down to 200 meters (660 feet). So we should be OK the next time we go for a dip at Barry Island. Running outside the watch is a tough, engraved, 'elapsed time' unidirectional bezel with interior tachymeter, which we actually found a use for! (if you time the gap between railway mileposts you can bore your fellow passengers with regular updates about the train's speed). See: more uses for a tachymeter. 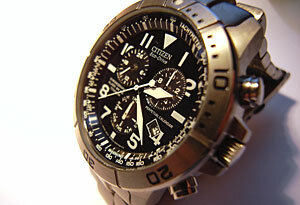 In reality, most people would probably use the handy rotating bezel for timing tasks. We certainly did. First off, we have to say the watch looks fantastic. It's really attractive and well made. It's light on the wrist, comfortable to wear and the high contrast white hands against the black face makes it very easy to read the time from all angles, with very little reflections from the high quality glass. The strap - with its 'push button' safety deployment clasp - is lightweight, tough and secure, although you'll probably have to visit a jeweller to get the strap adjusted (or break out your DIY mini screwdriver set). Mind you, with all this technology on tap, it's not surprising that we were forced to RTFM read the manual before we could set the watch up fully, but once you've got your head around the way it works, it's pretty straightforward stuff (albeit a little slow in operation). The chronograph and dual time worked exactly as advertised and the alarm made just about enough noise to wake us up from a light sleep (like most waterproof metal watches, you're never going to get that much noise out of the things, so heavy sleepers should invest in a trusty alarm clock or use their mobile's alarm instead). One thing we didn't like about the watch was that once or twice we managed to accidentally knock the mode dial, so when we went to check the time we were momentarily confused to see something completely different on the dial. But these are minor grumbles from what it a really attractive, eye-catching and solidly built timepiece that should last way past the manufacturer's five year guarantee. What's more, its light powered energy source means that you can do your tiny bit for the environment too. 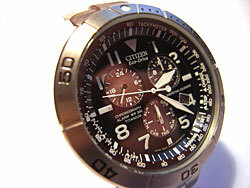 The Citizen BL5250-53L (snappy name, by the way guys!) retails for £299 - but can usually be picked up online for around £240.